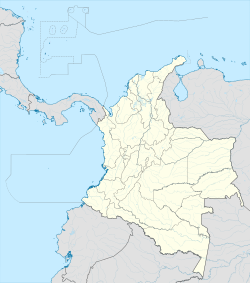 Location of the municipality and town of Los Patios in the Norte de Santander Department of Colombia. The history of this community begins in the 17th century. It began as the hacienda "Los Patios", which developed into a small country town, which later became a corregimiento de Villa del Rosario and still later the 37th municipality of Norte de Santander. According to historical records, the proprietors of the original hacienda included Juan Aranda, Carlos Matamoros, and Reinaldo Viccini, who engaged in agriculture, principally of cacao. Other nearby haciendas now incorporated into the municipality were La Rinconada (now Tennis Club and the Colegio Santo Ángel), Kilómetro tres (now Urb. La Floresta), Los Colorados over the plain of the River Pamplonita; Los Vados; El Hato, Located on the land that is now the Kilómetro 8 neighborhood; El Suspiro (today Vereda Agua Linda); La Garita, Buenos Aires (near los Vados) and García, owned by Agustín García, now the recreational park San Rafael. ^ "World Gazetteer". Archived from the original on 2013-02-17. This page was last edited on 8 August 2018, at 15:21 (UTC).